I was a member of the DGPA in previous years, how do I register? If so, please log onto our website, www.detroitgp.com and follow the link to "Volunteer." This will take you to our registration page where you will be able to register online with a credit card, or download a paper application and pay the membership fee with a check or money order. If you do not have access to the Internet, you may register in person at our offices in the Renaissance Center or call our office and we will mail you an application. I am a new volunteer this year, how do I register? The registration procedure is the same for new members as it is for returning members. I sent my application in online (or in the mail) and would like to confirm that it was received and processed. All requests like this need to be directed to Hannah Deacon. Please email volmanager@detroitgp.com or call (313) 748-1800. The DGPA charges a membership fee, why do I have to pay to volunteer? Since its inception in 1983, it has been the DGPA's policy to charge a nominal membership fee. (This year's fee of $15 represents a 25% reduction as compared to the fees charged for the 2001 event.) The reason for this fee is that it helps to ensure that people take their commitment to working on the race seriously and it cuts down on the number of "no-shows". One hundred percent of the money collected is returned to the members in the form of member benefits. In fact, the membership fee represents a small fraction of the volunteer budget of the DGPA, as the race promoter subsidizes all the operational and most of the member benefits costs of the organization. The DPGA has done everything it can do to hold the line on membership fees since 2012 and earlier. However, costs for the Kick-off Party and other DGPA benefits continue to rise, necessitating this stepped increase. What kind of benefits will I receive as a member? Race weekend uniform, including shirts and a hat (colorful weekend wear, with logo, to show that you are a volunteer staff member who helps to make "the wheels turn"). Race credentials for the full three days of race weekend. Lunch served all three days of race weekend in pleasant, picnic-like surroundings. Secured parking is provided to all members, with shuttle service to and from the island. The famous appreciation party will be held the week following the race providing a chance for all members to relax and trade "war stories" with old and new friends. Special DGPA ticket discount for member's friends and families. 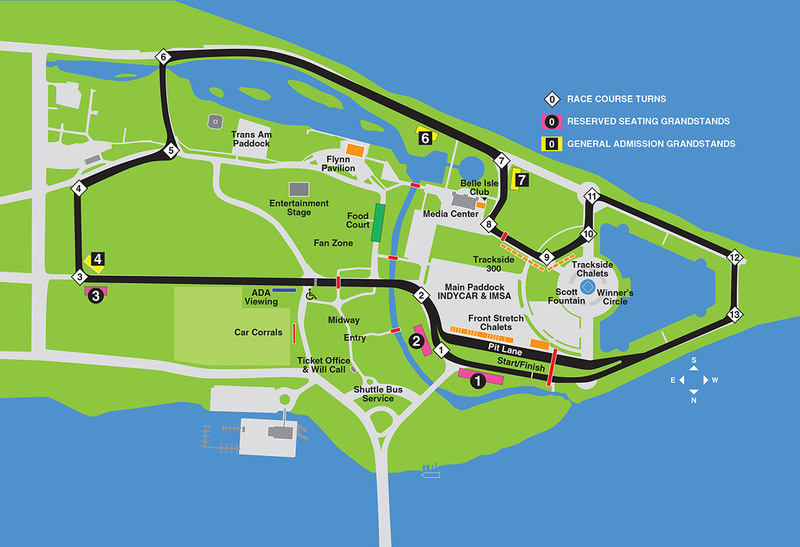 Discounts on official Chevrolet Detroit Grand Prix presented by Lear race merchandise. DGPA patch, lapel pin and certificate of appreciation upon completion of commitment. I don't feel comfortable entering my credit card information online. Can I still join the DGPA? You can also register in person in the Renaissance Center office. Please make check or money order for $20 (U.S. funds) out to: DETROIT GRAND PRIX ASSOCIATION *Please be advised: applications will not be processed until payment has been received. Is there any training required so I will know how to perform my job assignment? Yes. Mandatory orientation meetings will be held in May to provide basic information logistics, parking and the DGPA code of conduct as well as information and training specific to your assignment area. The orientation meeting is mandatory for all DGPA members and will be offered Saturday, May 18th from 10am-12pm and Wednesday, May 22nd 6:30pm-8:30pm at the University of Detroit Mercy Student Fitness Center. Members only have to attend one orientation meeting. I noticed that there is a minimum time commitment of 25 hours for the race weekend. How does that work? Each assignment area has its own timeline requirements but on average, volunteers are scheduled in eight hour shifts per day. The timing of specific shifts by area is noted on the volunteer application. You are asked to register for the same shift time each day. If you are not able to volunteer on Friday, there is the possibility of working a double shift on one of the weekend days although that opportunity is not available in all areas. I was a DGPA member last year. Do I still have to attend the orientation? Yes. The orientation is MANDATORY for all DGPA members, returning and new who wish to volunteer for the Chevrolet Detroit Grand Prix presented by Lear. You will not be issued a credential or volunteer uniform if you do not attend one of the Mandatory Orientation dates. May is pretty far away, what if I can't make the orientation date I choose? If at any time in the coming months you need to change your orientation date, please call Volunteer Services at (313) 748-1800 and the change can be made. Please remember that orientation is MANDATORY, you will not be issued a credential. I registered online and chose my top three job preferences, when will I be informed which volunteer area I have been assigned to? As soon as your application is processed by Volunteer Services, you will receive a confirmation letter noting that it has been received. Confirmation of your actual volunteer assignment will be sent in April. I'm interested in more than just one volunteer area - can I work in multiple areas on race weekend? Because of the orientation and training required to perform the duties of a volunteer, we ask that all volunteers register for only ONE area. If you are interested in working additional areas you can sign up as a Volunteer Resource Pool volunteer as well as joining the promotions committee. Volunteers must be at least 16 years of age. Any volunteer 16 or 17 years old must be accompanied by an adult and cannot volunteer for Circuit Marshalls or On Track Services due to liability concerns. Any volunteer 18 years or older, may volunteer for any area.